Our discovery of broccoli sprouts and of their potent chemoprotective, antibiotic, and anti-inflammatory activity, has cascaded into a series of new developments. The manifold beneficial biological activities of broccoli sprouts are attributed almost entirely to their content of glucoraphanin, which is converted in the plant and in the human gut, to sulforaphane. 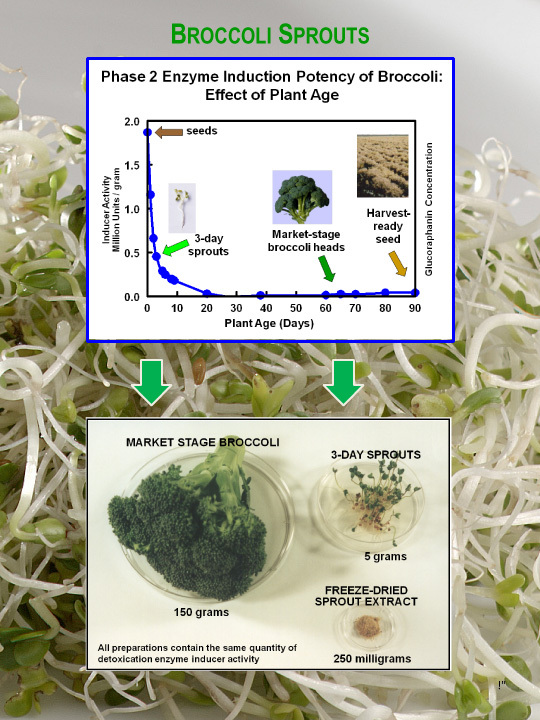 Broccoli sprouts had never been previously grown prior to our discovery. Their content of glucoraphanin, and hence sulforaphane, is governed by their genetics, and their growth environment. Broccoli sprouts are between 20- and 100-fold more potent inducers of chemoprotective phase 2 enzymes in mammalian systems, and hence better chemoprotective foods than traditional broccoli, on a ounce-for-ounce basis. Broccoli sprouts contain almost no indole glucosinolates (the compounds that predominate in market stage broccoli, which may not have a completely favorable health profile).